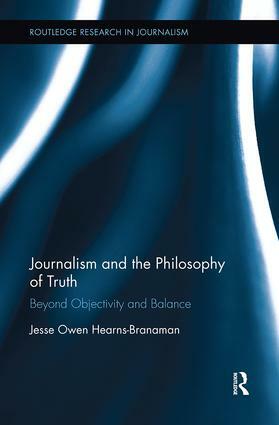 This book bridges a gap between discussions about truth, human understanding, and epistemology in philosophical circles, and debates about objectivity, bias, and truth in journalism. It examines four major philosophical theories in easy to understand terms while maintaining a critical insight which is fundamental to the contemporary study of journalism. The book aims to move forward the discussion of truth in the news media by dissecting commonly used concepts such as bias, objectivity, balance, fairness, in a philosophically-grounded way, drawing on in depth interviews with journalists to explore how journalists talk about truth. Jesse Owen Hearns-Branaman is Assistant Professor at the National Institute of Development Administration, Thailand. He researches the political-economy and sociology of journalism, emphasizing on the USA, UK, and China. This series is our home for innovative research in journalism. It includes monographs and edited collections that provide insight into a field that faces the challenges of an ever-evolving news and media environment.